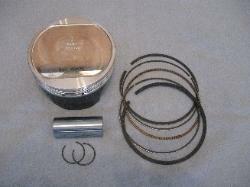 These German made forged piston kits include rings, clips and pin. Piston is Moly Coated and the Pin is coated with diamond-like carbon, providing anti-friction qualities. Note: Replating of the cylinder may be necessary if the NIKASIL coating is excessively worn.